Jill Biden made news introducing her husband at Dartmouth yesterday afternoon, testifying that she has seen Joe up close, making a wide motion with her hands. The reaction of the students in attendance strongly suggests what was on their minds, though Vice President Biden’s remarks predictably focused on the size of handouts rather rather than hands out of size. Biden effectively embroidered his pitch with allusions to the Romney video. I’m sure there is more where that came from. Reader Michael Sheldon’s wife is a Dartmouth alum. She happened to be on campus yesterday and snapped the photo below on the Green at the center of campus during the campaign stop. 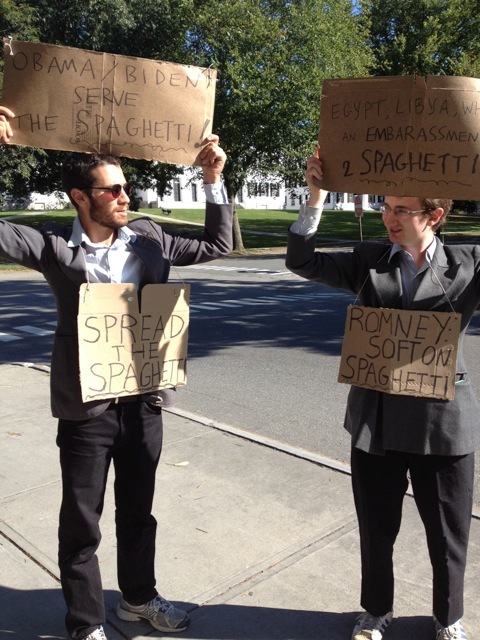 This must surely qualify as the most obscure protest of the campaign so far. What gives? I know that the student meal plan has been a hugely contentious matter on campus, but it would probably be a mistake to take the signs literally. Spaghetti seems to serve an allegorical purpose of some kind.